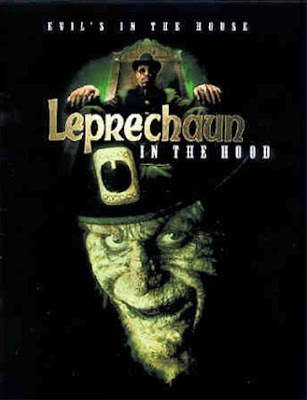 Leprechaun 5 is the last in the Leprechaun box set, but not the last of the Leprechaun films. This film returns to Earth, and is set on the mean streets of Compton with a tale involving a group of desperate rappers who get into trouble with the local Gangster. The films tone is much more serious than the previous films, and this is reflected by the more realistic death scenes as opposed to ridiculous over the top ones. The film starts in the 1970's. 2 crooks discover a statue of a Leprechaun next to a pot of gold. One of the crooks unwisely decides to remove the necklace from around the statue bringing it to life. A fortunate event leads to the necklace soon being put on the Leprechaun. 20 years later and a group of rappers desperate to win a music contest and get out of Compton rob a local Gangsters house to get money to fund their dreams. It just so happens this Gangster is the crook from 20 years back. One of the stolen items is unluckily a necklace that was on the neck of a statue at the former crooks house. With the aid of a magical golden flute the rappers are on there way to stardom, but both the Gangster, and the Leprechaun are hot on their heels with murder and vengeance in mind! 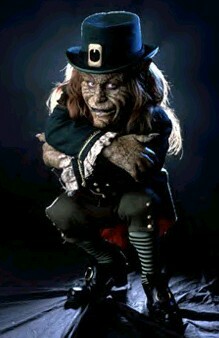 Warwick Davis is again the Leprechaun. In this guise he joins in the spirit of Compton, forever smoking Weed, and recruits a lot of women who he names his zombie Ho's and who do his bidding. The Leprechaun is back to his rhyming, and it is probably the best it's been (though still awful!). The Gangster is played by Ice T, he doesn't have much screen time, and plays the stereotypical angry Gangster. The 3 rapper 'good' guys are quite interesting. There is Butch the fat, stupid one, Stray Bullet the aggressive one, and their leader Postmaster P. They have several rap gigs during the film, all are awful, but they are shot like music videos (though shot like very low budget music videos). The films tone is far more serious. There are lots of deaths, but for the most part people are killed either by guns, or by the Leprechaun strangling people. There are no crazy deaths this time around. The Leprechaun this time has Jedi type powers, able to control peoples minds, and move objects with the power of his mind. The films style is all American Gangster, so the mainly black cast F, and blind there way through there lines, with plenty of use of the N word. The ending credit sequence is kinda dreadful though as for some reason the end credits play over Warwick Davis and his Ho's doing a terrible terrible rap! The film wasn't too bad though, again it had nothing to do with the previous films, other than the similarity in the necklace, and a redone scene from Leprechaun 2. Have ordered Leprechaun 6, so will review that as soon as it comes here!